The movement repertoire that develops in the first year of life is a language in itself and conveys desires, intentions and emotions. This early life in motion serves as the root of ongoing nonverbal interaction and later verbal expression – in short, this language remains a key element in communication throughout life. In their path-breaking book, gestalt therapist Ruella Frank and psychoanalyst Frances La Barre give readers the tools to see and understand the logic of this nonverbal realm. They demonstrate how observations of fundamental movement interactions between babies and parents cue us to co-constructed experiences that underlie psychological development. Numerous clinical vignettes and detailed case studies show how movement observation opens the door to understanding problems that develop in infancy and also those that appear in the continuing nonverbal dimension of adult communication. Their user-friendly non-verbal lexicon — foundational movement analysis — enhances perception of emerging interactive patterns of parents and their babies, couples, and individual adults within psychotherapy. Clinicians in any setting will find this book to be a masterful application of infant research and movement theory that significantly augments clinical acumen and promotes greater understanding of the nonverbal basis of all relationships. 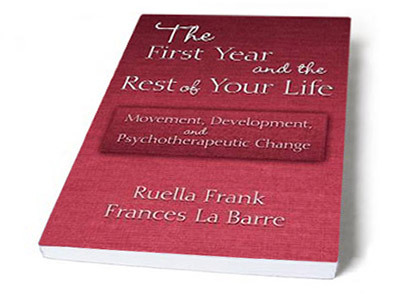 “The in-depth method of study offered by Ruella Frank and Frances La Barre, foundational movement analysis, is of great value to psychotherapists who focus on interaction and contact, and affords a sharp tool to ground process work in a field perspective. Going beyond the empirical understanding of nonverbal expression, the authors show how body movements point out the unformulated and pre-reflexive areas of experience. They also demonstrate how feelings, to which psychotherapists are so sensitive, are a 'later-developing aspect of the experience of physical and kinetic elements of interaction,' without falling into the trap of a linear cause-and-effect way of thinking. “This fascinating and undeniably important book will do nothing less than widen and reorient your perception of human movement. Reading Frank and La Barre will actually change what you see. And you do see it, too, because the book is packed with marvelous, detailed illustrations. If you are interested in mother-infant observational studies, the interaction of parent couples, or individual psychotherapy, this is essential reading. Psychotherapists will make discoveries about their patients, themselves, and the interaction that they might never have suspected.